James (Jim) Hidefumi Mukoyama, Jr.
Infantry School, Ft. Benning, GA; 1st Bn, 23rd Infantry, 2nd Infantry Div. Korea; S-1, 1st Bn., 23rd Infantry; S-1, 3rd Brigade, 2nd Infantry Div. ; Assist. Sec. to the General Staff, Training Center, Ft. Lewis, WA; Administrative Assistant to the DCG, Ft. Lewis, WA; Commander, Company A, 4th Bn. 3d AIT Brigade, Ft. Lewis, WA; (Active duty) - Commander, Company B, 4th Bn., 39th Infantry, 9th Div. Vietnam; Operations Officer, II Corps, Vietnam; G-3 Plans Advisor, II Corps, Vietnam; Staff Officer, DPCA, USAG, Ft. Sheridan, IL. Combat patrolling on de-militarized zone, Republic of Korea; combat in Mekong Delta, vietnam. Infantry officer, commanded a company in Vietnam; commanded a division for Desert Storm. 9th Division Mekong Delta Campaigns May - Aug '69. Korea - Lived in metal Quonset huts in an isolated company compound in the de-militarized zone. Vietnam - Four months in the field as a company commander. Operated from a battalion fire support base. Took showers at base camp from overhead 50-gallon drums. Eight months at II Corps Headquarters in Pleiku (Central Highlands). Relatively comfortable living conditions with 2-man rooms and indoor showers. 1. Learning about intra-Japanese American animosity between Hawaiian and mainland (West Coast) Japanese-Americans 2. Very few incidents of racial prejudice, although a vivid one during officers basic course at Ft. Benning, GA where all of the oriental students in my command were assigned the task of carrying the heaviest weapons. 3. Highlights: commanding an infantry company in combat; being the first oriental to command a division in our Army's history. That freedom is not free; that we all need to serve our nation in some capacity; and that democracy is a reality in terms of equal opportunity (I was able to attain the highest rank possible in the Army Reserve). 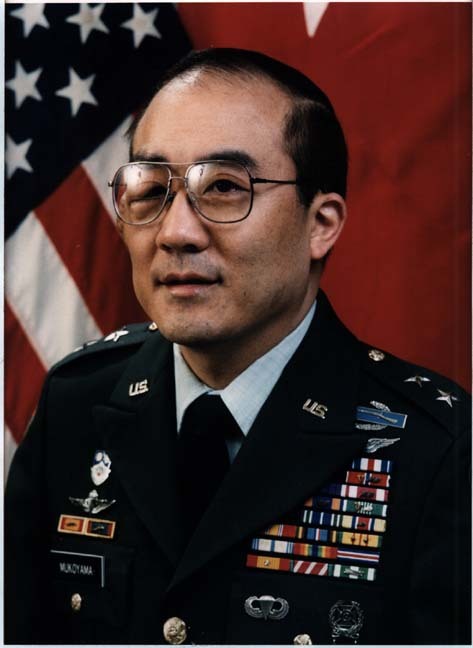 General Mukoyama was the youngest General Officer in the entire United States Army in 1987 and subsequently the youngest Major General when he received his second star three years later. 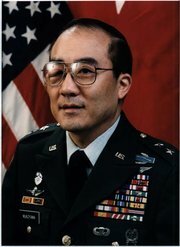 In 1989, he became the first Asian-American in the history of the United States to command an Army division. His division, the 70th Training Division, located in the states of Michigan and Indiana, was the first Army Reserve Training Division ever to be mobilized at Fort Benning, Georgia, when it was called to participate in Operation Desert Storm in January 1991. In less than 76 hours, 1500 of his soldiers were on active duty at Fort Benning. In 1993, General Mukoyama founded the Army Reserve Association, or ARA, the sole non-profit professional organization representing the 1.2 million U.S. Army Reservists world-wide with membership inclusive of soldiers and army civilian employees of all grades. As the ARA's elected President, Mukoyama has testified before the U.S. Congress and participated in the Normandy 50th Anniversary D-Day observances. In civilian life, General Mukoyama has been in the securities industry for over two decades and is a former member of the New York Stock Exchange and the Chicago Board Options Exchange. He is presently the Executive Vice President and Chief Operating Officer of Regal Discount Securities, a national deep discount stock brokerage firm in Chicago. General Mukoyama is active in mumerous veterans and community organizations and serves on national boards. He is listed in Marquis Who's Who in America.